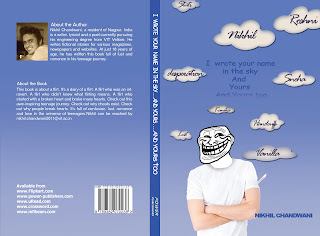 While walking through a bookstore my eyes got locked to a very illustrious cover having a troll guy on it(the one we see every day in our facebook feeds) titled 'I wrote your name in the sky...and yours...and yours too'. Title and the cover reminded me of someone whom I used to know. I smiled and immediately bought it and I definitely do not regret it. The novel is a easy read of 100 pages which one can complete in just one sitting. It is the story(much like a diary) of a 18 year old who travels a journey of sincere lover being heart-broken to a teenage flirt who broke others heart. It is the book full of love, lust, romance, confusion, drama, humour and what not. The book is a perfect amalgamation of all the emotions which a teenager goes through. 'When the bookstore is already flooded with chick-lit love flicking books, then why the other one?' You may ask. But even though it is not the first book on teenage love life, it keeps the reader affix to the story. It is the kind of book with which we can easily relate to. What I liked the most is the impeccable usage of poetic lines at the beginning of every story. NIKHIL CHANDWANI is a resident of Nagpur, India is a writer, lyricist, and a poet currently pursuing his engineering degree from VIT, Vellore. He writes fictional stories for various magazines, newspapers and websites. 'I wrote your name in the sky...and yours...and yours too' is his debut novel which is already a hit. We, THE ADROITS, wish him all the very best for this future endeavours.